Ravinder Singh Sidhu – Ravi to his friends – is a Sikh, and his faith is important to him. In 1999, when war was raging in Kosovo, Ravi decided that he wanted to carry the Sikh principles of selfless service and universal love beyond his own community. That’s how Khalsa Aid was born – a small humanitarian relief agency based in Slough near London that helps people in disaster zones regardless of their religious affiliation. The first donor was a Muslim businessman, and Ravi’s first mission was organising an aid convoy to Albania to help Kosovan refugees stranded in the cold and mountainous border area. Khalsa Aid now operates in countries ranging from Haiti to Iraq and Syria. It attracts donors and volunteers from the UK, North America and Australia. Sikh ethical principles underpin everything Ravi does. 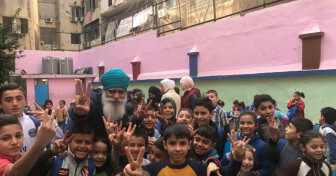 In this programme, Nelufar Hedayat travels with him to Lebanon to see how Khalsa Aid helps some of the more than one million Syrian refugees stranded in the country, including many children. For Nelufar, herself a former child refugee from Afghanistan, these encounters bring up strong memories. Exceedingly moving tribute to the power of courage and faith! !